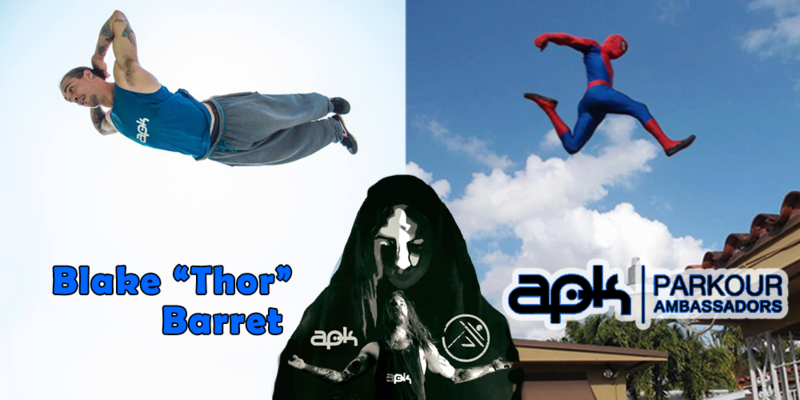 APK Ambassador Blake “Thor” Barrett is a real-life superhero. He lives his life in a away that inspires and improves the lives of others, especially the children he interacts with on a daily and weekly basis. APK: We know you like to dress up like Spiderman, can you tell us a little more about that? As far as entertaining kids I got into it about ten years ago and I highly contribute it to my true start of training in parkour. I get to wake up on weekends and be the super heroes I grew up loving so much while also getting to spread my passion for parkour simultaneously the kids and teenagers at my shows are hopefully the next generation of freerunners who can pursue the art and push it to the next level so I try and inspire on that front as much as possible. Besides that I get paid to literally jump off roofs what freerunner wouldn’t love that! APK: How has parkour training effected your life? Parkour has one hundred percent changed the person that I am. Years ago I met a kid with the biggest smile on his face who kept taking about parkour and how I was meant for it. Turns out he was absolutely right as usual. I’m speaking of Korey Sarvas who not only inspired me and so many others to start this journey into the parkour world, but when he passed left behind a true a legacy in South Florida. I think no other freerunner in South Florida has been more vital to parkour and spreading it in a positive light. APK: Losing Korey is a major tragedy in the parkour community, and it seems south Florida deals with more than it’s share of loss. In our local community we have unfortunately lost far too many loved ones and freerunners over the last few years. I’ve always used this pain to fuel my art in hopes of making those fallen proud of us and where we’ve taken our art. For me personally parkour has become me essence: I breath it, think it and bleed parkour. I’ve been lucky enough to have a family, friends and a girlfriend who are of utmost support to parkour and it’s community. I plan on keeping it that way since I don’t see myself ever being able to leave behind this amazing life I stumbled onto so many years ago. Thanks so much Blake, you are an inspiration to so many people, keep up the great work!